On August 1, 1907, British General Robert Baden-Powell organized a weeklong camp for boys on Brownsea Island, Dorset, England. This camp is recognized as the origin of the international scouting movement. 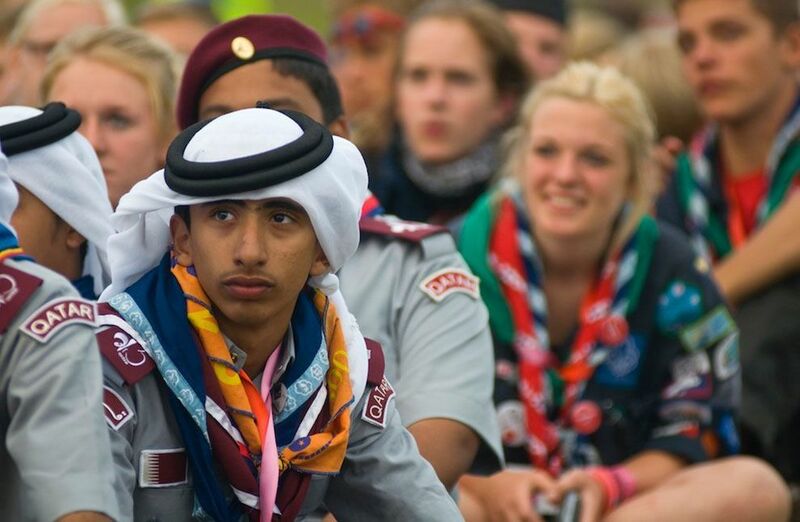 Qatari scouts listen to the closing ceremony of the 22nd World Scout Jamboree in Rinkaby, Sweden. More than 40,000 members of the worldwide Scouting movement attended the jamboree. Photograph by John Silva, courtesy World Organization of the Scout Movement. This file is licensed under the Creative Commons Attribution 2.0 Generic license. On August 1, 1907, about 20 boys attended a weeklong camp on Brownsea Island, off the coast of Dorset, southern England. Organized by British General Robert Baden-Powell, this camp is recognized as the start of the international Scouting movement. Baden-Powell had been impressed by the integrity and ingenuity of the teenage boys who served as scouts and messengers during the Boer War. After the war, Baden-Powell developed a popular series of books on basic orienteering, survival skills, and environmental awareness. In addition to these skills, the Brownsea Island camp included military drills, physical exercise, and Christian prayers. A year after the Brownsea Island camp, Baden-Powell helped found the Boy Scouts. Today, the Scouting movement includes the Boy Scouts, Girl Guides, and Girl Scouts. More than 500 million people in more than 200 countries have participated in the Scouting movement. The countries with the largest Scouting groups are Indonesia, India, and the United States. (1880-1881, 1899-1902) one of two wars waged between the British Empire and independent states led by descendants of Dutch settlers (Boers) in South Africa. The First Boer War was won by the Boers, the second by the British. practiced, repetitive exercise, usually a part of training for something. honor, or loyalty to moral and ethical principles. to coordinate and give structure to. sport or activity where participants navigate a path or object using maps and compasses. to take part in an activity. communication with a spiritual deity. person sent to obtain information. participating in the activities of the Boy Scouts or Girl Scouts. techniques or abilities that may be used to help you or others survive a dangerous situation.